Today’s podcast will inspire you to ask yourself if the trajectory of your life is the path you are meant to be on and show you its possible to begin again. 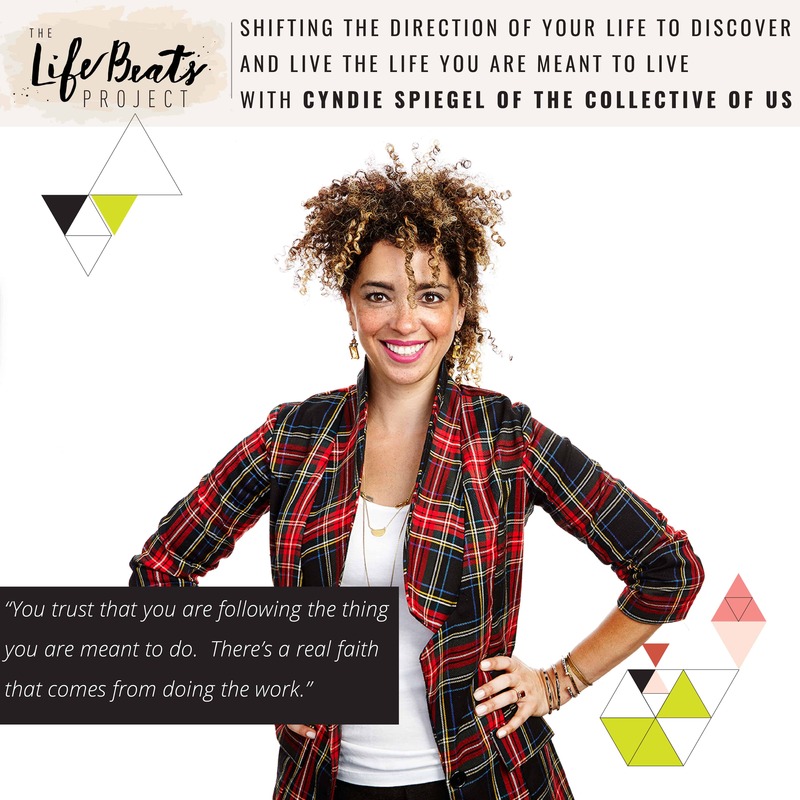 Cyndie Spiegel is a speaker and coach for women entrepreneurs with a fire in her spirit that is contagious. She is a professor at Parsons, a yoga teacher, and the founder of The Collective (of Us), an online business incubator, accelerator and sisterhood for women. Cyndie and I met as blind roommates at the blogger conference Altitude Summit and I learned so much from her in those 3 days and her life seriously reads like a movie script. Today Cyndie shares her story of growing up in poverty as a biracial girl with a determination to break out of others’ expectations of her and embrace her differences. She tells of her 15 year career in high fashion working with top designers traveling the world and the pivotal occurrence when she finally discovered that she was meant to do something more in line with who she really is. She tells of the 8 month long hard journey of question asking that opened herself up to knowing what that was – helping to empower other women to be true to who they are fundamentally in their core and to build their brand. We discuss some incredibly empowering concepts like learning to shift the direction of your life to discover and live the life you are meant to live, being permission givers, living with the abundance mentality, learning to embrace our differences by embracing our sameness, and coming to an understanding of who you are beneath it all without the titles. She shares how she helps women entrepreneurs through this process of answering these hard questions to direct and accelerate their business through the Collective of Us. Come listen and feel her contagious, confident spirit that comes from asking yourself the hard questions, that will inspire you to take a look at yourself in a new way and lift you in your own life’s goals. Want to know if this episode is for you? This episode is perfect for someone looking to live their life more in line with your beliefs and values and someone looking for courage and direction on how to do that. It is perfect for someone struggling to find their place or embracing their differences. And it will speak to those who want to change the direction of their life and are open to asking themselves the hard questions. It is also perfect for someone who is wanting to break free from the expectations someone else is placing on them. transitioning at age 35 to her own business Cyndie Inc.